Gardener, broadcaster and writer Geoffrey Smith has died aged 80. He appeared on BBC Radio 4's Gardeners' Question Time for 20 years and created one of the great gardens of northern England - Harrogate's Harlow Carr. Radio 4 controller Mark Damazer praised Mr Smith's "wonderful blend of erudition, wit and warmth". He said: "[Geoff] had a real connection to the audience and I'm very grateful for all he did for the programme and Radio 4 as a whole." Mr Smith, who joined Gardeners' Question Time in 1983, was one of the programme's longest-serving and best-loved panellists. His BBC Two series Geoffrey Smith's World of Flowers was watched by more than five million viewers, and he also presented Gardeners' World. Audiences were attracted by Mr Smith's philosophy that plants have unique personalities, share human feelings and "need as much pampering as women". Trevor Taylor, executive producer of Gardeners' Question Time, said Mr Smith was "a giant of horticultural broadcasting" and would be "sadly missed". "Geoffrey was the perfect gentleman; he had old world values, abhorred impoliteness and vulgarity and although Gardeners' Question Time is a radio programme he always dressed impeccably for the recordings," he said. "His love of gardening was matched by his love of his native Yorkshire and he was known as gardening's Geoffrey Boycott. 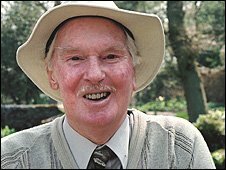 "He was an absolute mine of horticultural information, had a great wit and his poetic turn of phase made him one of gardening's great broadcasters." Mr Smith was an old-school gardener and staunch Yorkshireman with a golden rule: "Put the brown end in the soil, the green end above it, and you're in with a much better chance." He was proud to grow plants in Yorkshire which were thought unsuitable for a northern climate, saying it was a "confidence born of ignorance". Mr Smith decided his life's work would be outdoors after a year at boarding school, where he felt "incarcerated" and had to leave. He trained with his father for six years, then at horticultural college. At the age of 26, he was made superintendent of the Royal Horticultural Society's garden at Harlow Carr, North Yorkshire, where he worked for 20 years. Gardening, Mr Smith believed, put the world to rights. "Some people go to the whisky bottle," he once said. "I go into the garden." This week's Gardeners' Question Time (Sunday, 1400 GMT) will carry a tribute to Mr Smith with contributions from his fellow panellists together with some of his broadcast contributions.